I am at the beginning of my Terrace dressup project. 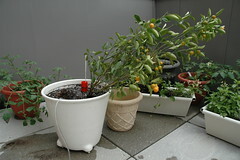 Bought a few IKEA PS FEJÖ self watering plant pot. The color scheme works nicely with the rest of the terrace. Planted our Clementine Mandarin orange tree in one of them. 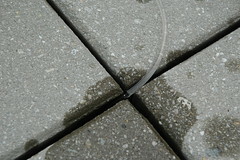 Then came the heavy rain. 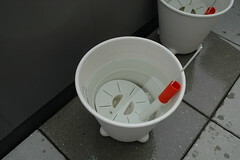 Because the pot is self watering, meaning there is a water reservior in the bottom, there is no drain hole. With a few days of non stop rain, the pot of soil turned into slush. 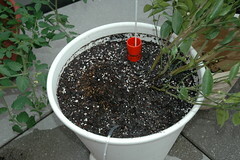 About 30 minutes later, the soil in the pot is (almost) back to just very very wet. I will keep the hose there now and next time it gets flooded, a little (careful) sucking and I can siphon out water again. Newer PostWhy can't they make quiet microwave doors?